Yesterday I observed the International Space Station (ISS) twice. 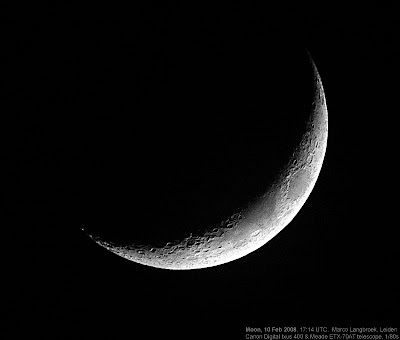 The first observation was in deep twilight, 20 minutes after sunset with the sun at only 4 degrees below the horizon. I filmed this pass, using the "movie"-mode of my Canon Digital Ixus photo camera. 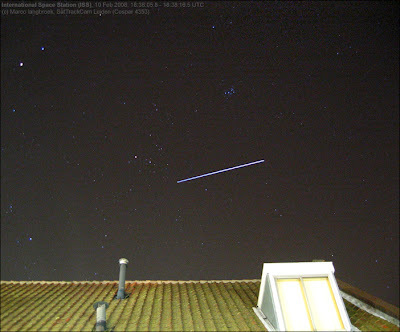 The resulting short movie is below: it shows the ISS descending towards the east. Both this evening and the morning of today (the 11th) I telescopically observed a number of other objects; the keyhole USA 129 (96-072A), the ELINT USA 32 (88-078A), the SAR satellites Lacrosse 5 (05-016A) and Lacrosse 3 (97-064A), and the NOSS 3-2 duo (03-054A & C) and, as a stray while waiting for USA 32, the old NOSS 6F (84-012F).